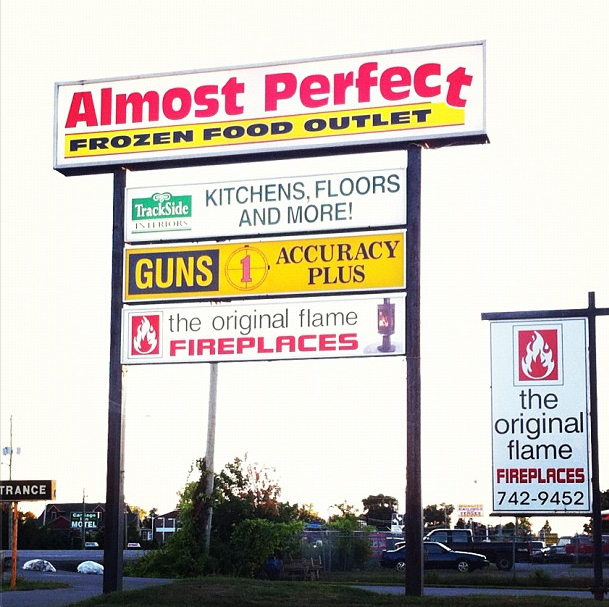 Almost Perfect Frozen Foods…wait, what?! Doesn’t this sign just beg for a caption contest? I just love it. From the name itself to the visual image of the word PERFECT deteriorating and falling apart. Time and time again Tad and I are baffled at the name of this frozen food store when we drive by it on the way to Apsley (and the cottage) along Hwy 7. It’s just…well, when it comes to frozen chicken….I’d actually like it to be fully perfect. I am thinking that whoever came up with this name is no longer in advertising. Wow, I agree – you don’t really want damaged food, people. Of course you have to go in there now and tell us all about it.